As I’ve raved many times before (first visit, second visit) Gervasi Vineyard, a winery in Canton Ohio, is simply amazing. The grandeur starts as you pull in the grounds, and doesn’t diminish in any detail throughout the compound. Seriously please just check out these 360 tours on the Gervasi site to see more of the space. The grounds feature plenty of spots to explore including the vineyards, lake, Marketplace gift shop, casual dining spot the Crush House, outdoor patio the Piazza and main Italian Bistro. I was lucky enough to visit this past weekend for their annual 8th Annual Bellissimo arts & craft festival. To me, one of the best things about a visiting a winery is the fun of a wine flight! The Brigante, their sweetest red is my favorite wine by Gervasi (besides the moscato of course). It is is described as having an “assertive structure, complex berry flavors – ‘Bad Boy’ personality“. I’m surprised that I like this wine so much because its not just sweet, but has another layer of something, maybe a smokiness, that I didn’t think I’d like so much. It is delicious. I can’t help but take another bottle home with us after each visit. I am still fascinated with how gorgeous the Bistro restaurant is. It appears to have been designed with an attention to detail. From the looks of it no cost was spared on the hardware, finishes or decor, really creating a lovely ambiance. I was lucky enough to be treated to another amazing dinner here by my boyfriend 🙂 For dinner I enjoyed the Apple and Brie Salad with mixed greens, dried cranberries, toasted pecans, and a balsamic vinaigrette. My main meal was a delicious and rich pasta dish the Breaded Chicken Campanelle of garlic, shitake mushrooms, spinach, fresh tomato, garlic cream sauce. My boyfriend had another great meal. The Mela Maiale a bone-In Pork Chop with blue cheese, creamy polenta, topped with brussels sprouts, pancetta caramel apple sauce – a pretty fancy dish for $22! 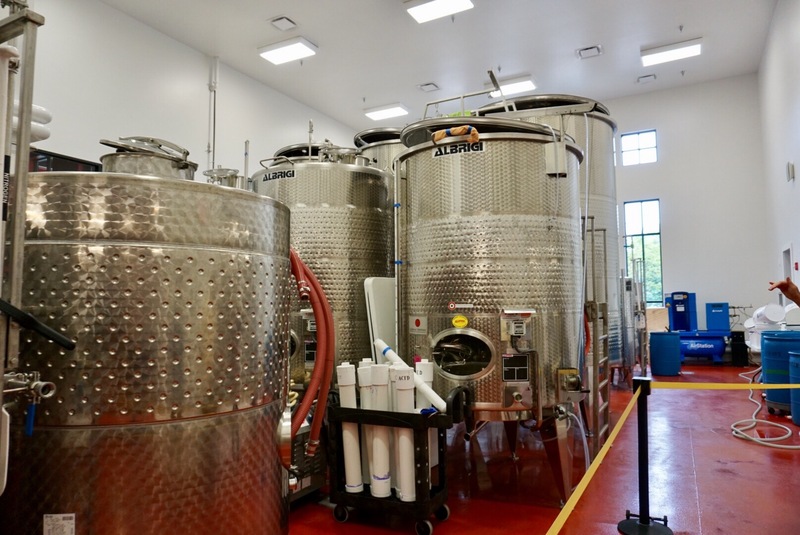 On this visit we were able to take a free behind the scenes tour of the winery in the Crush House building! I love looking around in each building on the compound, the unique lighting really stands out to me! I see myself having a wine bottle chandelier of my own in the future. As lavish as the decor is you’d think the menu would be too right? It is! Full of rich, rustic Italian fare, so many delicious choices. Check out the menu here. The best part of all of this? It is affordable. I’m serious. A trip here is a lot more affordable than the usual upscale Italian in downtown Pittsburgh. It is hard for me to say if its the wine, the food, the scenery or the ambiance that keep me wanting more of Gervasi. I love it all. Even the drive home through the fields of Ohio is great scenery. I’d love to stay here someday, everytime I call it is booked </3. I’ll keep waiting to see the inside of those villas. I would encourage anyone to check Gervasi winery out for themselves. Sounds like an awesome vineyard to go to! The food looks amazing and it looks like you had a great time there! Thanks for sharing your experience with us! This place is GORGEOUS! I love the ambiance and architecture. The wine flights and food look amazing. Thanks for sharing your experience! omg if I’m ever in Ohio, I have to visit this place! Looks so beautiful! I love visiting wine farms, and this one looks spectacular! The pork chops with blue cheese, omg! I know blue cheese it’s an acquired taste, but I absolutely love it! I love the architecture and all of the different pieces of furniture here. It’s so unique. And the food looks absolutely incredible. The pork chop just begins to make my mouth water. Wine flights…yes! Sign me up please! This is a gorgeous vineyard and the food looks absolutely amazing as well. I would love to stay in one of those villas as well and if you ever get in there, I hope you share photos!